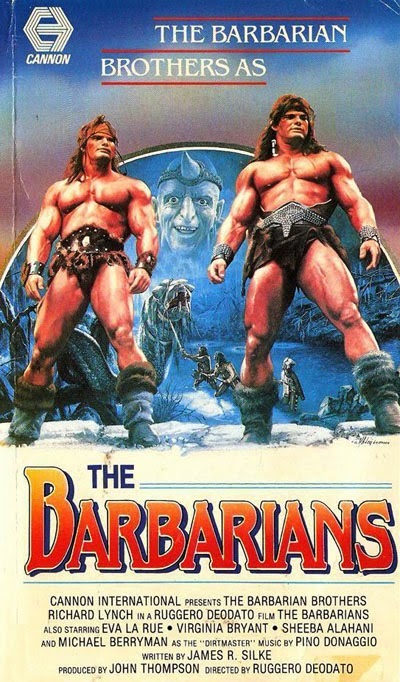 "The Barbarian Brothers as...The Barbarians"
In a mystical faraway land of swords and sorcery, two twin brothers are orphaned and adopted by a traveling caravan of weirdos. 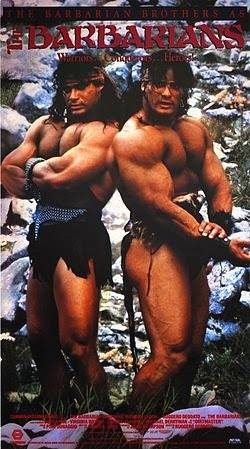 When the nefarious warlord Kadar (Lynch), in a quest for more power, attacks the traveling troupe and imprisons Queen Canary (Bryant) and enslaves the brothers in a work camp, at least some good comes out of it: a lifetime of lifting rocks has turned the two brothers into massively muscular “Barbarian Brothers”. Kutchek (Peter Paul) and Gore (David Paul) want to free their beloved Queen, so, along with another newly-freed victim of the wrath of Kadar, a girl named Kara (La Rue), they go forward on their quest. Along the way they meet all kinds of crazy characters and people, not the least of which are Dirtmaster (Berryman) and Jacko (Eastman). Will they slay the dragon? Will they find the magical ruby that fits into the bellybutton of the future queen? Will they argue and make weird, animalistic noises? Find out today! 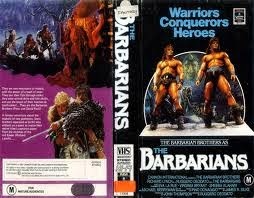 Connecticut’s own The Barbarian Brothers truly come out to shine (literally - they glisten) in their first major, starring role. It truly was an amazing time for the film industry and the world of video stores alike - the fact that projects like this could be made and distributed around the world would not happen today. That Cannon would put Ruggero Deodato in the director’s chair, and - of all people - The Barbarian Brothers front and center is nothing short of a miracle. The result is a fairly freewheeling journey into a magical land filled with wacky costumes, crazy makeup, and oiled-up meatheads. It was the 80’s, after all, and things like Dungeons and Dragons, He-Man, and the Conan The Barbarian series (he’s only ONE barbarian. Here you get two for the price of one) were huge. Not to mention video games like Iron Sword (remember the Fabio cover? ), Gauntlet and later Golden Axe. Even the breastplate that one of the brothers wears later in the movie is very He-Man esque. And seeing as how Lucio Fulci directed Conquest (1983), Cannon probably figured, ‘okay, this sword-and-sorcery stuff is huge right now, let’s get another Italian director known for his horror/gore work and have him run the show’. Deodato provides a weird/wacky vibe, and the whole thing is well-shot in typical Italian style. While Dolph Lundgren was ideal casting for Masters of the Universe (1987) - could you imagine He-Man x2? Well, imagine no longer. Fan favorite Richard Lynch was good casting as the baddie, and it’s probably the only time we’ve ever seen him with dreadlocks. He must have impressed Deodato after working with him on Cut and Run (1985). Same goes for Michael Berryman, who also appeared in that movie two years earlier for Deodato. Berryman is always cool to see, and he makes some great faces, and has some impressive headgear. Same thing for George Eastman, we always enjoy when he pops up when you’re not expecting him to, which happens fairly often. Eva La Rue makes a cute companion to the Barbarians on their quest, and there are some lesser characters with notable features such as a guy who can only be described as “Pee Wee Amidala” (you’ll know him when you see him) and a baddie who looks a lot like Bane. Interestingly, in this “origin story” for the Barbarian Brothers, they actually take the time to explain WHY they’re so huge, which you don’t often see for other meatheads. The brothers themselves have a silly kind of chemistry which has helped earn them a fan following. The movie fluctuates between childish fun and more adult themes, so it’s hard to tell exactly who this was aimed for. Perhaps the ideal audience is immature young men like us. Featuring an uncredited song with the lyrics “Your ruby dreams taste so sweet”, The Barbarians remains a lightweight 80’s Barbaric good time. Also check out write-ups from our buddies Dead Moon Night and The Video Vacuum! Nice one guys. I remember this fondly, as being very silly, but mainly because the brothers acted like children. LOL. I almost keeled over when I discovered a few years back that none other than Deodato directed this, which still blows my mind. What a weird detour for the guy. I plan to check this out again at some point, because I love well made low-budget barbarian flicks. Great job! The brothers were also pretty good in "Double Trouble"
RobotGEEK: Thanks for the kind words. Deodato is a genius...and paired with the silliness of the Barbarian Brothers, you have a great combo. Venom: Agreed. That was pretty good...we'll review that one eventually. Haha. These were probably the most meathead-y characters ever committed to celluloid. The movie went between good and silly, and I could never determine which one was the winner. I have to rewatch it someday. Definitely worth a re-watch! Haha. Got to love these meatheads. They should make a comeback. It's not too late.